Aktion Associates announces the acquisition of Maximum Computer Systems, Inc (MCS), effective December 1, 2018. This transaction is the continuation of a series of strategic Aktion investments recently made to improve our solution delivery in the wholesale distribution industry. The acquisition of MCS increases our Infor customer base to more than 750 companies running Infor CloudSuite Distribution (CSD), Infor Distribution SX.e, Infor Distribution A+ or Infor Distribution FACTS. Customers will now have access to a full service IT workforce of more than 200 IT professionals in the continental United States who provide network engineering, software engineering and application and industry consulting to companies in Construction, Distribution and Manufacturing verticals. Philip Maehr will become the General Manager for our Supply Chain East business unit and will report to Bob Lindeberg, Vice President, Supply Chain Division. 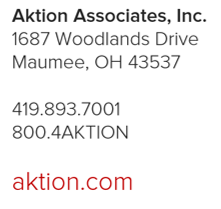 All prior MCS field sales and service personnel have formally joined Aktion Associates. Our intent is to make this transition seamless and continue to deliver uninterrupted service to the customer base. Aktion values its customer partnerships and, as such, plans to transition the MCS personnel and customer base with no immediate change in existing customer agreements or billing rates. We will honor all project delivery dates and financial terms previously negotiated in the MCS project backlog. Existing support contracts will be honored and we will strive to improve the overall service delivery. Aktion Associates will consolidate MCS’s support operation into our world-class NOC staffed with experienced IT professionals. They will be available to answer any level 1 support calls and attempt to resolve issues on the first inbound call. Support calls can be elevated to on-call level 2 experienced Infor A+ and SX.e/CSD professionals. Direct employee phone numbers and email addresses will remain unchanged until the end of the transition period when new information will be made available. The existing MCS phone support number (855)-627-7878 will be answered by the Aktion NOC or you can contact the NOC directly. Aktion Associates has built a reputation for offering leading-edge technology solutions, industry-specific software and application consulting to businesses of every size. Our emphasis on Distribution, Manufacturing and Construction verticals allows us to be focused on the business processes most important to our customers. In addition to delivering infrastructure & network engineering and industry- specific cloud-ready software applications, Aktion offers managed networking services and Cloud services for those customers looking to modernize IT operations. We view our role as IT architects who partner with our customers to create a comprehensive technical roadmap that supports the strategic objectives of our clients. The world’s largest technology innovators choose to partner with Aktion, including Infor, Sage, Acumatica, Viewpoint, Cisco, IBM, HP, and Microsoft. Our customers rely on Aktion Associates to be responsive, innovative and to provide consistent delivery of leading-edge technologies. We do this every day, 24/7. We look forward to meeting each and every MCS customer and strive to help you get the most out of your IT investments.